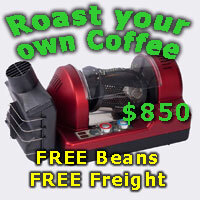 I recently purchased a Mazzer mini -doser and got some fresh coffee beans to go with that. Currently I'm using aeropress to extract but would like to buy a machine in the next week or two. Any suggestions for a machine that might be able to do some milk coffees but mostly black coffees for around $500 (or less)? Last edited by Mugle; 26th May 2018 at 05:28 PM. Welcome Mugle....it may improve the response's to you if you give some indication where your located. Whilst this is an Aussie based resource...it is increasingly seeing more and more interest worldwide. Just like "Oils ain't Oils" ...there's fresh coffee beans And Then there's Fresh..as in the CS'ers world. Do yourself a flavour and do some research here using the search function. Or better still use google and add 'CS +' to the search question. For straight espresso a single boiler should be your first port of call. to an E61 based single boiler. The Isomac Zaffiro is a cracker in this class - but not the only one. Thanks Espressoadventurer. I have now updated this to state my location. I actually bought the sample pack off of the CS website last week - really enjoying all the aromas coming from my cup compared to when I used super market beans. Thanks for the tips - I'll be sure to check out the benefits from an E61 class machine.